Aurore Gagnon was a young girl who died on February 12, 1920, under suspicious circumstances. Aurore was born on May 31, 1909, in Ste. 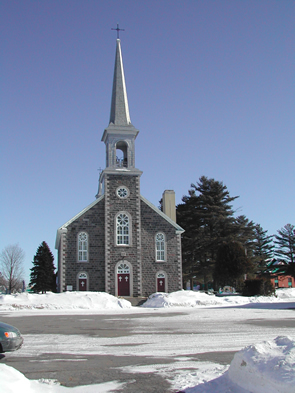 Philomène de Fortierville, in the county of Lotbinière, Quebec. Her mother died in 1918 and her father, Télesphore Gagnon, a farmer and logger from Fortierville, remarried immediately afterwards. Aurore died two years later, at the age of ten. The coroner’s inquest revealed that she had succumbed to blood poisoning and general exhaustion, the result of the great number of untreated wounds which covered her body. What really happened to Aurore Gagnon? Who was responsible for the mistreatment and abuse that she had clearly suffered? How did this rural family become such a dangerous milieu for this young girl? And how did Aurore Gagnon become Aurore, l'enfant martyre, an icon of Quebec popular culture? These are some of the questions we invite you to consider, as you explore this site that is devoted to the life and death of a Quebec child at the beginning of the twentieth century. As you explore this site, you will enter into history, embarking on a voyage into the past. You may find yourself inside the skin of a worker reading his daily newspaper, or that of a housewife in the galleries at the trial of Télesphore Gagnon and his wife, Marie-Anne Houde, at the Quebec City Court House in the spring of 1920. You will not simply follow the proceedings of the trials and the investigations; you will also enter into a rural Quebec village and see how people lived and related to one another. Through the story of Aurore Gagnon, you are invited to discover many facets of Quebec society in the 1920s: how rural families were structured, what special treatment was reserved for women accused of violent crimes, and how the mass media played a role in the formation of collective memory. As you proceed you will be introduced to the abundant documentation left to posterity in the wake of the “Gagnon affair.” You will play the role of the historian as you reconstruct a story and its interpretation on the basis of materials that survive from the period. We invite you to consult a variety of documents, including newspaper articles, depositions, legal documents, personal letters, novels, a play, a film, and photographs. Through our “virtual archive,” you will carry out the work of a research historian and find answers to the main questions asked. At the end of your experience, you can compare your conclusions to the interpretations reached by specialists in the field. Like the other sites of the Great Unsolved Mysteries in Canadian History project, this site offers you a journey into the past and a virtual experience that resembles that of a detective who – like a historian – tries to reconstitute events and their significance through a series of clues. Since our starting point is a horrible crime perpetrated on a ten-year-old girl, we must warn you that some of the events related here might be disturbing for some users, especially younger ones. That being said, Aurore! The Mystery of the Martyred Child offers you the simulation of a historian’s work and thus the opportunity not only to learn the “historical facts,” but also to learn about the steps that are taken by anyone – a historian, a student, or a private citizen — who wants to understand the past.